So I came up with this concoction for the husband the other day and dare say so myself - it is DELICIOUS! You see the husband loves apple pie and I didn't feel like making gluten free pastry etc.. So I just chopped up some apples baked them in the oven and then put my trusted cookie dough recipe i always use on top and baked it and OH WOW, Why haven't I tried this sooner? 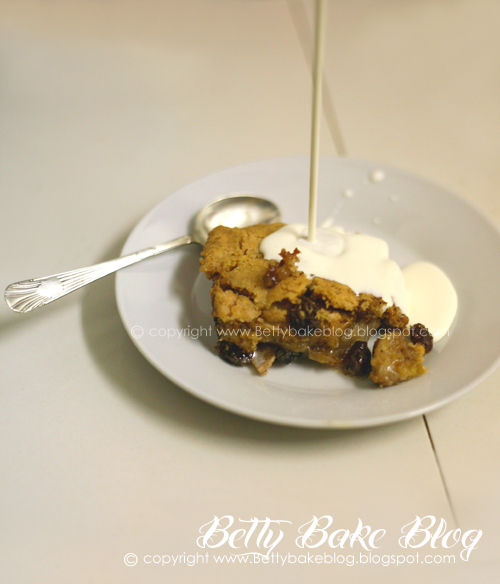 Then sprinkle with raisins, brown sugar and a generous amount of cinnamon. Place in the oven and bake at 180 degrees celcius, stir occasionally and cook until the apples are starting to soften but not fully cooked yet. While the apples are baking assemble the cookie dough. Then stir in the flour, baking powder, and bicarbonate of soda ensuring that everything is well mixed. Add more flour if you need to the mixture should be nice and soft but not runny. Once the apples are semi soft baking away in the oven take out the dish and plop/dot the cookie dough all over the mixture - yes it looks messy but it will spread out. The idea is for there to be little blobs of cookie dough all over your apple mixture but you can still see little bits of apple peaking through. You may have to much cookie dough for your pie - you can either bake some cookies or put it in the fridge in a sealed container for a second cookie dough pie tomorrow :) trust me you'll want another. oooh...make me some. yum yum yum! Yummy me...now how am I going to get through the day without this! this looks delicious! i wish i could bake! @Che you so can make this even if you don't bake :) try it!!! really! I just popped my first try at this into the oven. It looks and smells like heaven! I used to make same but just crumble gluten free cookies mixed with butter & brown sugar and chopped pecans which is great, but this is like a real upside down apple pie and I can't wait to eat it! I've been gluten free now for two years and seriously this is the first time I think I'm going to have baked something succussfully! Thank you thank you! Okay, now I'm digging in. yummmmmmmm yum! Thank you for this awesome recipe. I'm in heaven!